This fettuccine recipe was inspired one of the many trips I made to the Testaccio Market while in Rome over the past couple of weeks. As the dollar was creeping toward an all-time low against the Euro, I somehow convinced Wayne it was a good time to go to Rome - not only that, I convinced him it was a good idea to spend nearly a month in Rome and central Italy. Because of the time difference between San Francisco and Italy we'd find ourselves wide-eyed at 5:00 a.m. those first couple of mornings - ready to start the day. Rome was still dark and quiet, and for those few early hours the cobblestone streets outside our window were void of the characteristic melee of cars, scooters, pedestrians, and baby buggies fighting over common byways. Our apartment was in the heart of Trastevere, and depending on your choice of footwear, within walking distance of most of the center city. If I were to try to emulate the Italians in their 3-inch stilettos, chances are I wouldn't make it across the Tiber. A few cafes would roll up their metal gates at sunrise. An hour or so later you might stumble on vendors setting up umbrellas and tables in the middle of a piazza, getting ready for the first influx of shoppers. Rome's markets are legendary, and while the Campo dei Fiori and San Cosimato markets were the closest to our apartment, I found myself looking forward to a daily trek south through Trastevere, across the Ponte Sublicio, and down the street to the Testaccio Market in Rome's ancient slaughterhouse district. The tourists were few and far between (in contrast to the rest of the city), and the market is frequented by Romans from the immediate neighborhood. The sellers were friendly - the elderly lady with her eggs stacked up by the dozen and half dozen on a collapsable card table in one corner remembered me on day two (or maybe it was just my painfully bad Italian), there was a great range of produce, and much of it seemed well cared for. Shopping at the markets in Rome is an interesting exercise for me. It's both totally comfortable and curiously foreign. I'm familiar with much of the produce and know what to do with it - shop well, and don't screw it up by over-handling it once I get it back to the apartment. It's the market etiquette that throws me for a loop. Is it o.k. to bag your own tomatoes, or is that considered rude? The woman in front of me just bought enough greens and onions to feed forty people. The guy behind her bought five paper bags brimming with oranges and apples. Is it going to be weird if I want to buy just this one head of garlic? And on and on. I try not to sweat it too much, fumbling along, mute for the most part, smiling and gesticulating a lot. More times than not people smile back. My first double-take at the Testaccio Market (and the inspiration for today's recipe) came when I walked by a vendor selling mushrooms. The porcini left me slack-jawed. They ranged in size from small to super-sized, bits of dirt and moss clung to each stem. Not to be outdone, the chanterelles glowed with golden light from their neighboring baskets. What to buy? I use chanterelles quite a lot at home so I opted for few modest-weight porcini. In addition to the mushrooms I picked up a dime-bag of freshly ground pepper that would later leave my lips tingling for hours. A short walk across the street to the little shop selling fresh egg pasta was my next stop. Behind the glass counter they had four or five types of pasta to choose from - none seemed quite right. 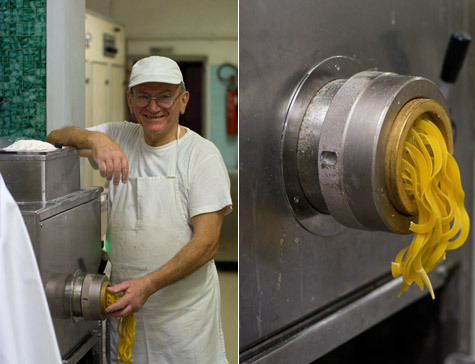 I turned my head and caught a glimpse of a man leading long strands of fettuccine from the pasta machine, he gave me a warm smile. I pointed and gave a hopeful look to the woman behind the counter, and she said, "ahhhhh, fettuccine?" Si. I left with enough fresh fettuccine to feed a small army under one arm, my market finds in a bag under the other. Wayne had a small piece of Pecorino cheese back at the apartment leftover from a picnic the day before...plenty to provide for a tasty dinner in our adopted kitchen - which by the way, was outfitted just slightly better than dueling gas burners in the New Zealand camper van ;)...More posts (and photos) to come from Italy soon! I used pecorino, but you can use Parmesan if that is more convenient. I suspect this would also be delicious with spinach or whole wheat noodles, or a blend - similar to the "straw and hay" recipe in Super Natural Cooking. Feel free to use dried noodles as well, if that is easier for you to come by. If porcini mushrooms aren't available feel free to substitute brown mushrooms - roughly a cup or two chopped. If you want to get extra decadent, finish off the noodles with a splash of cream. In the meantime, heat 2 tablespoons of the olive oil in your largest skillet over high heat. Add the mushrooms and a big pinch of salt. Saute the mushrooms until they release their liquid and begin to brown. Now stir in the garlic and cook for another 30 seconds or so. Remove from heat and set the skillet aside - I also set aside a little stash of the browned mushrooms (in their own little cup) to use later as garnish. Salt the pot of water generously and cook the fettuccine noodles according to package instructions - this is usually just a minute, or less. Drain. Transfer the noodles to the skillet with mushrooms, and stir in the black pepper, cheese, lemon zest, and the remaining 2 tablespoons of olive oil. A splash of cream tossed in here would really take things over the top - totally optional.